This page is meant to provide a resource for beginning students who are interested in learning more about general relativity (GR) and gravitational waves (GW). It is not meant to be a comprehensive listing, but merely a collection of books, articles, and other resources that I have found useful. Enjoy! Read chapters 5, 12, and 16 of Shapiro & Teukolsky's "Black Holes, White Dwarfs, and Neutron Stars". While you won't appreciate all the details, this is the fastest way I know of to gain a concise understanding of GR, black holes (BH), and GWs. The second fastest way is to read Chapters 1, 2, and 24-27 of Blandford and Thorne's "Applications of Classical Physics". This (soon to be published) book, which formed the basis of the Ph136 course at Caltech, is an immense resource for not only relativity but also statistical physics, optics, elasticity, fluid mechanics, and plasma physics. It is a modern-day version of the Landau-Lifshitz series (focused on classical physics). Richard Price's article titled "General relativity primer" in the American Journal of Physics provides a nice concise description of GR. See also the related comment by Tryon. Schutz's "A first course in general relativity" is an excellent introductory book that I primarily used to learn GR. It follows the standard (tensors-first) approach. Hartle's "Gravity: An introduction to Einstein's general relativity" is considered by many to be the best book for learning GR. It takes a "physics-first" approach, delaying the introduction of tensors. I used this in teaching an undergrad GR course. A General Relativity Workbook, by Thomas Moore is excellent. It closely follows but slightly improves upon Hartle's text. It introduces a bit more tensor analysis in the beginning, presents each topic in concise chapters, and leads the student through all derivations. Much of the text contains partly blank pages where the student must fill in derivations and hand them in to the instructor. This is part of Moore's attempt to increase students' classroom engagement and reduce lecturing. I plan to use this the next time I teach GR. See the author's website for info on this book. Zee's "Einstein gravity in a nutshell" is highly regarded on Amazon, but is geared more toward particle physicists than astrophysicists. "Spacetime Physics" by Taylor and Wheeler. Not a GR book, but a great book for learning special relativity well. Uses little math beyond algebra (but still contains many challenging problems). A great place to learn about all the various "paradoxes" of special relativity. Exploring Black Holes, also by Taylor and Wheeler and at the same level as their Spacetime Physics book. Relativity, Gravitation and Cosmology: A Basic Introduction, by Ta-Pei Cheng is also favorably reviewed on Amazon and follows an approach similar to Hartle's. Advanced Mechanics and General Relativity, by Joel Franklin. More emphasis on field theory/action principle approaches than the above. Carroll's Spacetime and Geometry: an introduction to general relativity. Probably the best advanced text to learn from. MTW (Misner, Thorne, and Wheeler), Gravitation. A classic. Comprehensive but a bit dated. Not the best place to start learning GR. Weinberg's Gravitation and Cosmology. A well-written book from the perspective of a particle physicist (and Nobel winner). Has a good introductory discussion of post-Newtonian theory. Norbert Straumann's General Relativity has an interesting selection of topics with many applications to relativistic astrophysics. (Thanks to Emanuele Berti for the recommendation). Poisson's A relativist's toolkit, covers special advanced topics. See also the author's website for an early version of this book and other notes, including a course on post-Newtonian theory. Wald's General Relativity. Mathematically rigorous, but not suitable for beginners. Hawking & Ellis, The large scale structure of space-time. A classic with an emphasis on global methods. Not for beginners. T. Padmanabhan's Gravitation: Foundation and Frontiers. James Anderson's Principles of Relativity Physics, an older book but with some formal topics not covered in other texts. Ed Bertschinger's lecture notes on GR..
General Relativity and Gravitational Waves, nice lecture notes by J.F.J. van den Brand and C. Van Den Broeck. Gravitational-wave physics and astronomy, a great overview of the field by Creighton and Anderson. Gravitational waves, another excellent book by Maggiore (see also his book on field theory). Gravitational radiation: a new window on the universe, Kip Thorne's unpublished book from 1989 (a bit dated now). Ph 237:Gravitational-waves, Kip Thorne's web-based course at Caltech, w/ video lectures and homework problems. See also Thorne's Lorentz lectures, as well as other lectures on his website. Analysis of gravitational-wave data, by Jaranowski and Krolak. Weber's "General relativity and gravitational waves". Not a text, but Alan Weinstein's Physics 4 (freshman seminar) class at Caltech has some good slides, readings, and assignments. Baumgarte and Shapiro's Numerical Relativity: Solving Einstein's Equations on the Computer. Rezzolla and Zanoitti's Relativistic Hydrodynamics. Alcubierre's Introduction to 3+1 Numerical Relativity. Gourgoulhon's 3+1 Formalism in General Relativity: Bases of Numerical Relativity (see also his book on Special Relativity in General Frames). Wilson and Mathews' Relativistic Numerical Hydrodynamics. Friedman and Stergioulas, Rotating relativistic stars. Meinel et al, Relativistic figures of equilibrium. Gourgoulhon, An introduction to the theory of rotating relativistic stars. Buonanno's lecture notes on GWs. A good resource for the beginning student. The basics of gravitational wave theory, by Flanagan and Hughes. An excellent review; especially useful for its gauge-invariant formalism for GWs. See also Bertschinger's lecture notes on the weak-field limit of GR. and chapters 6-8 of the lecture notes by J.F.J. van den Brand and C. Van Den Broeck. Sathyaprakash and Schutz, Physics, astrophysics, and cosmology with GWs; a comprehensive review article. See also the list of other Living Reviews articles. Buonanno & Sathyaprakash, Sources of Gravitational Waves: Theory and Observations, a not yet published review that gives a good status update of PN theory and LIGO observations. Cutler and Thorne's Overview of GW sources. Review article by Rana Adhikari focusing on experimental aspects. Pulsars and Gravity by Richard Manchester. Lecture notes on black holes by Townsend. Black hole physics by Frolov and Novikov. Introduction to black hole physics, by Frolov and Zelnikov. The mathematical theory of black holes, by Chandrasekhar (not an easy read). The geometry of Kerr black holes, by O'Neill. Black holes: the membrane paradigm by Thorne, Price, and MacDonald. Pedagogical articles on GR, BHs, or GWs. On a related note to the above article, see the articles by Garfinkle and Koop and Finn. Black and Gutenkunst, An introduction to signal extraction in interferometric gravitational wave detectors; a nice article giving some of the details of how interferometry works. Response of interferometric gravitational wave detectors, by Sam Finn. These papers by Saulson and Ma et al discuss the issue of energy absorption by a laser interferometer. Light bending and perihelion precession: A unified approach, by Brill and Goel. The impossibility of a simple derivation of the Schwarzschild metric by Gruber, Price, Matthews, Cordwell, & Wagner. General relativistic perihelia precession and the anharmonic oscillator, by Olsson. Note related to GWs or GR, but a useful article by Joe Burns: Elementary derivation of the perturbation equations of celestial mechanics. Quantum mechanics in curved space, by Donoghue and Holstein. Gravity:Newtonian, Post-Newtonian, Relativistic, by Poisson and Will. Following an excellent treatment on Newtonian gravity not found elsewhere, it systematically develops the post-Newtonian formalism in detail. A great book. Gravitational Radiation from Post-Newtonian Sources and Inspiralling Compact Binaries, Blanchet's massive Living Review article, updated in 2014. Post-Newtonian gravitational radiation by Blanchet; a shorter version of his living review. The Post-Newtonian Approximation for Relativistic Compact Binaries, Living Review by Futamase and Itoh. Eric Poisson's lecture notes on PN theory. 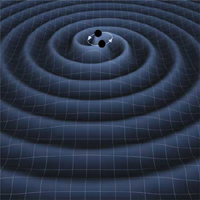 Centrella's resource letter on gravitational-waves has citations to various useful articles. Cliff Will's resource letter on testing GR. Resource letter on BHs by Gallo and Marolf. The LIGO LAAC Educational Resources page (LIGO access only). This page at MIT has links to various useful articles related to GWs. hyperspace@aei, general news, conferences, and job listings relevant to the GW community. AstroGravS, GW source archive (no longer actively maintained). Einstein's Messengers (NSF site), (youtube). LIGO: A Passion for Understanding (space.com site), Kai Staats' site, (youtube). Gravity: Making Waves, short science bulletin by the American Museum of Natural History (AMNH site), (youtube). LIGO 7min documentary video (youtube). LSC website; LIGO Caltech site; LIGO Livingston; LIGO Hanford. Kagra main site; U. Tokyo GW Project Office; CLIO/LCGT; TAMA. Resonant mass detectors: Nautilus/Explorer (also here); AURIGA; MiniGRAIL; older list of GW detectors (see also the bottom of this wikipedia page for a list). space-based: eLISA; (old NASA LISA page); DECIGO (also here). PTAs: IPTA, International pulsar timing array consortium; NANOGrav; EPTA; PPTA. future ground-based: Einstein Telescope; SKA. Caltech Tapir group; SXS collaboration; Thorne homepage. University of Florida astrophysics; Cliff Will homepage. LSU relativity group; LSU GR research page. Institut D'Astrophysique de Paris, gravity group; Blanchet homepage. research article search engines: arXiv.org; NASA ADS abstract search; Google Scholar; inSPRIE. GW Astrophysics, a very nice website by the Birmingham GW group. Inside Black Holes by Andrew Hamilton. A nice site that explains what happens when you fall into a BH. LIGO Document Control Center (DCC). LSC Observational and Instrument Papers.